A big question on a lot of minds is whether what we are seeing is just the run-of-the-mill bear market reaction (a bear market rally or “dead cat bounce”) or whether perhaps this is the start of a brand new bull market. While I do have some ideas, I’m not sure myself. Well, no one really knows. What I mean to say is that I don’t have a strong conviction one way or the other right now. But I’d like to change that. So this week I’m going to cover the 7 prerequisites for a new bull market as set out by Jim Stack, the writer of the InvesTech newsletter. According to Stack, there are seven major conditions that have historically been present before we’ve launched into a secular bull market. Like most approaches to the market, these seven conditions simply allow for a list that we can check off. The more conditions are present, the better the chances that this rally is the real deal. But as always, never a guarantee in sight! 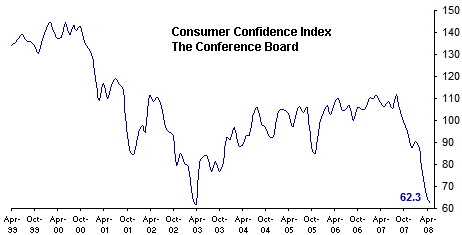 Plunge in Consumer Confidence - Marked by a drop of 35 points or more. This index is reported monthly by The Conference Board and is based on a representative sampling of 5,000 US households. It’s calculated as a weighted average composed of 40% current and 60% future expectations and is commonly used to predict the future health of the US economy. For investors, it can also provide a valuable clue to identifying the “Best Buy” opportunities on Wall Street. Logically, such opportunities seldom occur in the late stages of a bull market when consumer optimism is already frolicking at lofty levels. Instead, the time to start shopping for stock market bargains is after confidence has plummeted and gloom is widespread. In each of the past 5 recessions, the Conference Board’s Consumer Confidence Index has tumbled over 34 points before a new bull market was born. Watch for a similar drop that might help to confirm the next true low-risk buying opportunity. Incidentally, it is almost at the exact same level when the stock market reached its bottom in March 2003. Its good to see these two surveys agree with each other so much. 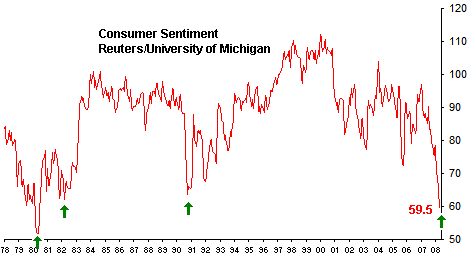 The Reuters/University of Michigan sentiment survey is even lower than where it was at the March 2003 market bottom. It is plumbing depths not seen since the early 1990’s and 1980’s. Curiously, back in the 1980’s, the unemployment rate was twice as high as it is now. Anyone familiar with market history will recognize those time periods as excellent times to buy. If you’re not or if you would like a refresher, just pull up a really long term chart from your favorite charting platform. So we can comfortably check off this condition as being met. The next one tomorrow. Oh and in the meantime, I highly recommend you give InvesTech a look see - and no, I am not affiliated with it nor do I receive any compensation if you do.